The Action List parameter is one of the EMML (Event Management Markup Language) complex parameters. In fact, it is the most complex EMML parameter. It is used to change the contents of an Event or to initiate a new Event when certain patterns are detected. Description is used to store short notes about given Action List and is displayed on the Object List as a parameter value (orange text in braces) for a given Action List. Auto-Set Description determines whether the Description should be entered manually by the user, or generated automatically from the descriptions of the contained Actions. Comments can be used to store more extensive information for a given Action List. To edit Comments, click on an (i) icon in the header of the Action List. The Actions area is used to add, remove and edit Actions. An Action is added by clicking on the (+ Add Action) button below the Actions area. An Action is removed by simply closing the desired Action. To edit an Action, open the Action Builder by clicking the Edit Action link. The Action Builder is an ECA Editor module used to create and edit Actions. Set Fields to Expressions area. Description is used to store short notes about a given Action and is displayed in the Actions Area of the Action List as a parameter value (orange text in braces) for the given Action. Auto-Set Description determines whether the Description should be entered manually by the user, or generated automatically from the contained Set Fields to Expressions. Comments can be used to store more extensive information for a given Action. To edit Comments, click on an (i) icon in the header of the Action Builder. Action Type menu is used to select the desired Action Type. 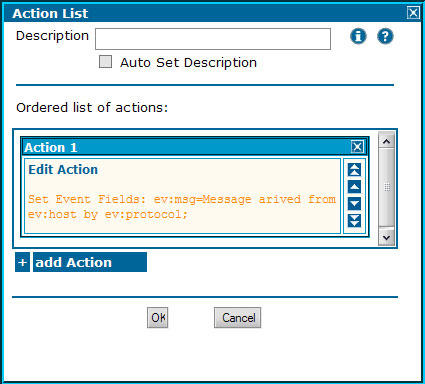 Set Event Fields Action - Changes the contents of a received Event. The Set Fields to Expressions area is used to add new and edit existing Event Fields. A Set Field to Expression component is added by clicking on the (+ Add Set Field To Expression) button below the Set Fields to Expressions area. For each Set Field to Expression component, the desired Event Field can be chosen from the drop down menu with the predefined Event Field names. Or, the custom Event Field name can be entered when "Custom" is selected from the menu. 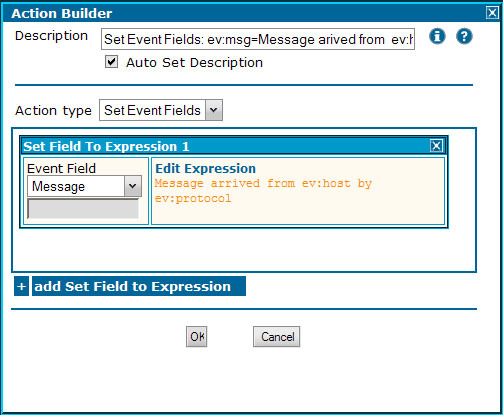 The content of the chosen Event Field is then edited using the Expression Builder.